The Museo Regional de Antropologia Carlos Pellicer is mainly dedicated to the Olmec and the Maya of the home state of Tabasco but there are also loans from other areas of Mexico, such as Teotihuacan. Since Teotihuacan influenced the Maya to a considerable degree it is important to go to your library and read up about this fascinating culture. 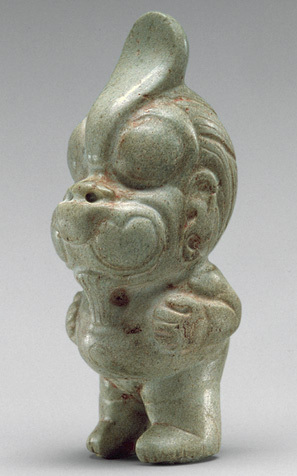 As a result of the two major Olmec art and archaeology shows (Princeton and Washington, D.C.) more people want to learn more about Olmec civilization, so we start with some images. While you are in Tabasco, be sure to visit the other museums, such as the village archaeology museum of Jonuta, Professor Omar Huerta Escalante, Director. If you are at Palenque with a rental car, drive over to the archaeology museum in the town of Emiliano Zapata, under the responsibility of Heberto Mendoza Ortega. They have a rare proto-Maya bowl with post-Olmec sympolism, several tiny hieroglyphic inscriptions, and two great incense burners. F.L.A.A.R. Photo Archive/Hellmuth photographs of the hieroglyphic texts are in Karl Herbert Mayer's most recent book on Maya sculpture (Johann Loserthgasse 16, A-8010, Graz, Austria), or you can order it through F.L.A.A.R. The Instituto de Cultura de Tabasco also maintains the village museum in Balancan, on the shores of the Rio Usumacinta. Additional museums in Tabasco are at the Maya site of Comalcalco (managed by INAH), at the Olmec site of La Venta (just 2 miles off the main highway, about an hour from Villahermosa), and at Parque La Venta, in the main park of Villahermosa. All material in the museums of Tabasco was photographed over the last several years with the specific permission Julio Cesar Javier Quero, at that time Director of Museums for the State of Tabasco. These images are now used on the Internet also with specific permission of Lic. Carlos Sebastian Hernandez, the Carlos Pellicer Museum, Instituto de Cultura de Tabasco, CICOM, Villahermosa, Tabasco. Copyright 1996.